Leave the Big Island and steep yourself in the history of Pearl harbor on this fascinating 7-hour tour ( not including the flight time and airport waiting time ). Fly to Honolulu Airport and then transfer to Pearl Harbor. From there, meet the tour coordinator to get vouchers and tickets and learn about the day's highlights. Take a small-group tour, including skip-the-line access, exploring the USS Arizona Memorial and getting a vivid picture of the December 1941 attack. Visit the USS Missouri Battleship and USS Oklahoma Memorial. Before returning to the Honolulu airport to go back to the Big Island you’ll visit a variety of Hawaiian heritage sites like Iolani Palace and the Statue of King Kamehameha, Hawaii state capital, Washington place and punch bowl national cemetery. Inter-island flights, transfers in Honolulu, site entrance tickets, plus the Honolulu history drive through tour, are included. This package will cover your need from airport to airport. From A to Z. Explore Honolulu, in general, and Pearl Harbor, in particular on this 7-hour tour from the Big Island. After landing in Honolulu, cruise in the comfortable car while enjoying a refreshing beverage. Get acquainted with Pearl Harbor at the visitor center and receive your orientation, tickets and vouchers from the tour coordinator. 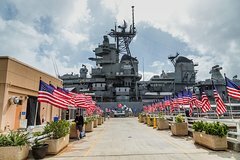 As part of this package you have a 35 minutes professional certified tour guide for USS Missouri battleship on Missouri as part of small group (25 people) and this will give an opportunity to learn about the history of the ships and getting a vivid picture of the December 1941 Japanese attack. Before returning to the Honolulu airport to go back to the Big Island you’ll visit a variety of Hawaiian heritage sites like Iolani Palace and the Statue of King Kamehameha, Hawaii state capital, Washington place and Punch bowl national cemetery. Inter-island flights, transfers to Pearl harbor and back to Honolulu airport, site entrance tickets, plus the Honolulu history drive through tour, are included. We also offering complimentary light breakfast and a Pearl Harbor lunch as part of this package. The tour concludes when your' dropped off at the airport for your flight back to the Big Island. Clients receiving a 75th anniversary of Pearl Harbor memorable MUG per reservation.